Yesterday was Mother’s Day, and when I arrived at church, I received a tulip. So did both my daughters. So did every woman who arrived at our church yesterday–whether single or married, biological mother or not. They are challenged and encouraged and pushed and comforted and guided and stretched and corrected–by all these women in ways that are specific to each one. I was very blessed this morning to read Mike Frost’s post “The Ferocious Motherly Love of God,” on this topic, and I am so glad to share it with you. May it encourage you as it encouraged me. Grace and peace this day. I was in full mom mode, in route from an evening parents’ meeting at the elementary/middle school to pick Em up from art class across the city. I stopped at a red light in North Lawndale, Douglas Park dark and deep on my right, and noticed a girl standing on the corner. The lights from across the street barely lit her face. But it was enough to make her tears shine. It was enough I could see her mouth, open with sobs, her hands, clenched in fists, pressed tight against her cheeks. I startled her; then the words came rushing out. I pulled around the corner onto the deserted dark street leading into the park and called her to come to the window. The red line. She needed to get to the red line, and she needed a bus to get to the red line. She’d missed the right bus, ran after, but didn’t make it. And she’d stood there, alone on this corner, till fear kicked in and she started crying. Anything beyond the green and brown lines, and I’m a bit clueless about the Chicago L system. In that moment I couldn’t even remember which direction the red line runs. But I knew this girl couldn’t stand on this corner any longer. “Will you get in?” I asked her. She hesitated, then figured the gray-haired woman playing soft music in her car was a better option, and got in. I turned the car around and headed east, into the city. Em’s art class is on the north side; surely there would be a way I could get this child to the red line on the way. We talked. I tried to drop as many reassuring bits of information as I could. Mom of four (turns out she’s the oldest of four), the ages of my kids (she’s fourteen, a freshman in high school; siblings are 12, 10, and 5), mother of twins (she’s a twin, too, though her brother died soon after birth, right on her mother’s chest. “His lungs weren’t developed enough.”) My name, her name. She said no. My shoulders relaxed. “You need a Kleenex?” I asked her. I laughed and told her that was just fine. She asked if I was a teacher—I have no idea why: do I still give off that vibe? She wanted to know if I was famous. I laughed again. Far from it, I said. We talked about her school then, how her mom and grandma and she picked it because it’s college prep, because it helps its students get scholarship money, because she wants to go to college. I pulled over to check the red line map, making sure I was under a street light, telling her what I was doing. I called Dave just to confirm what I thought would be the closest stop to Em’s art school. We talked more as I drove. Her face lit up when I asked about sports. Basketball is a favorite, track, too. We talked about her siblings, what they’re like. Younger sister by a year is actually taller, but she doesn’t want to play basketball; she wants to be a cheerleader, even with her long legs. Their aunt said she should play basketball like her sister, that if she became a cheerleader, she’d knock out the whole first row of fans when she kicked. We talked about her grandma, a police officer, about her own long commute to school from the south side to the west side, about where she lived before moving to Chicago. She said she would. I told her again where to cross the street, where to go up the steps to the platform. She got out and was gone. Later that night I got a text from her grandma. Her grandgirl had made it home safe. She’d made it home safe. And her grandma was very, very thankful. On Roosevelt Road at 7 p.m. This past spring, when we felt certain the Lord was moving us into Chicago, one of our first steps was to explore school options for our kids. The search for the younger three didn’t last too long. We visited two schools; one of them felt like a good fit to both them and us; and that decision was confirmed when we attended their back-to-school night this past week. Yes, they will face the difficulties of making new friends and learning new systems, but we know already they will be in a nurturing environment, one in which they already feel comfortable. This, however, has not been the scenario for our oldest child, Emily. Our first choice fell through. Then she found a magnet school she really wanted to attend. She made it past the first round of selections, but not the second. That was heartbreaking and sudden and late. We scrambled and discovered a charter school option. It wasn’t close; it didn’t have some of the classes she wanted, but we thought it would do. So she started classes there, but we found, after a week of trying to make it work, it simply was too far away. So late Thursday night, Dave and I discussed, again, her schooling choices. We weighed pros and cons and talked through different scenarios, and then, with exhaustion sucking us into sleep, we prayed a plea of confused desperation. The next morning I woke before the alarm. As I lay there, quiet, I received an insight into my daughter. I got a glimpse into why the less obvious, more complicated schooling choice might be the very best thing for her. I looked over at Dave and saw he was also awake. I shared with him the insight I’d received. He nodded and told me what he’d woken up thinking about. The two insights meshed; they fit together; they formed something that was enough of an answer for us to move forward with peace. But even greater than the answer was this: the Spirit’s whispered insights were not just a reminder of God’s great wisdom, they were even more a reminder of God’s Father heart for our girl, for our family. In that moment of shared insights I got a glimpse of God’s great, beating heart for my girl, who is, even more and always, HIS girl. He knows her, inside and out, through and through, better than I know her, better than her dad knows her, better than she knows herself. He loves her oh so well, so tenderly, so knowledgably. And that understanding is the best answer of all. Post script: When I opened up the Daily Office on my phone later on Friday morning—just after what I described above—I discovered the day’s hymn was “Day by Day,” one I remembered from my childhood. It was like a loving letter written just for us, but I suspect, in God’s incredible way of loving all his people, together yet so uniquely, it’s for many of us, so I’m sharing the words below. Is lament possible without identification? We white mothers must come to the point of understanding that we cannot say, “This could happen to my son—for no good reason—through no fault of his own—through no action of his own,” and really mean it, BUT nearly every African American mother CAN, and with these words a little surge of real terror spikes in her heart. That is an example of white privilege. I know it is, because as a white mother of a black son, I have a hard time really believing those words. 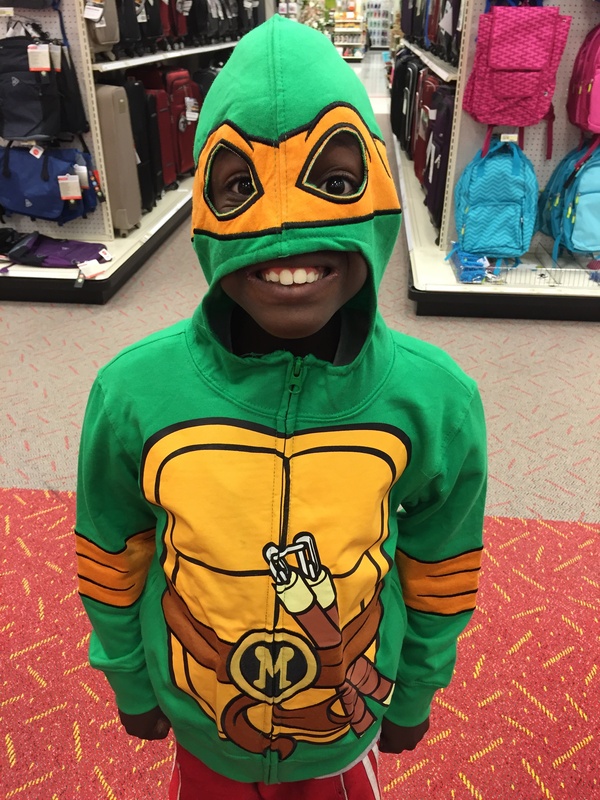 Though I know my son’s risk factors are high (he is black, very dark-skinned in fact, and he has pronounced ADHD and high impulsivity), I don’t have the history that makes his danger REAL to me. I don’t have the from-birth distrust of a system, of a majority group that sees me as inferior (though they don’t come right out and say so). My skin doesn’t ripple with a subtle prickle of fear when I see a man in uniform. Even though I am truly “in the shoes” of other African American mothers, my white privilege keeps them loose in the day-to-day. They’re not pinching my every step. Her response was immediate, and it wasn’t just emotional. Her breathing quickened; her face went pale, and she was unable to relax until we were miles into the country on the other side. I couldn’t identify, but I “got it.” She’s experienced “difference” her entire life. And I, except for when travelling in Africa (and the “difference” I experienced there brought, for the most part, privilege), have not. This morning I woke early. We are preparing for a move to one of those very neighborhoods where the other mothers in it live everyday with this fear for their children, where I, too, will experience it more, simply because of location. Because of this upcoming move, our house looks like a picked-over junk shop. It is at the stage when everything formerly “in”—cupboards, closets, drawers—is out, and all knickknacks are off shelves and ledges, revealing hidden dust. Late last night I moved the verse plaque from the windowsill above my kitchen sink. Behind the plaque I found a picture of my black son taken several years ago when he was in preschool. At some point I’d tucked it behind the plaque and forgotten about it. This morning, up before anyone else, I read updates on the shootings of Philando Castile and Alton Sterling. I cried. I prayed. Then I went to the sink to fix myself some tea. And there was the smiling face of my beautiful son, like a treasured photo of a lost loved one, placed in a spot where one sees it several times a day. If one is truly to grieve, lament, repent, this is what we must understand. and notice how worn and age-spotted they’d become. Strange that I mind my own aging far less than I mind theirs. And the oldest, though she remained in the passenger seat, could have sat where I was. I don’t know which of these caused my heart to gain weight and sink low. I thought moments like this would never, never come. And we would both laugh. As much as it is the being left behind, losing my belonging with them. Silly, I tell myself. You’ll simply belong in a different way. Is giving way to an independence on their part that makes me anticipate loneliness. Should cause my heart such pain. “Not for two more years, Mom. And the youngest out gallivanting with friends. My child with dark skin. But displacing him from a people? Now, though, they are harder. But what about his people? I thought this post could use a little lift. 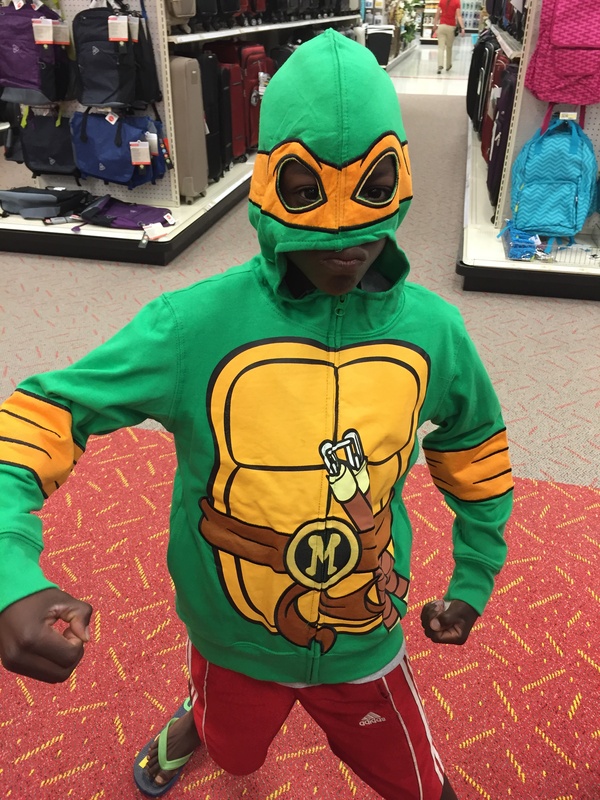 This was a fun, impromptu moment in Target when PJ saw this awesome Teenage Mutant Ninja Turtle jacket! I couldn’t resist posting this one, too! he was up to”… I think, “This is what’s facing my son,” and I ask God how I am meant to draw attention to this injustice, how I am meant to fight it—both for my own son and the sons and daughters of other women. And under all this, I still fear the effects on my son of growing up without a community that looks like him.